Hello! Sorry for the small hiatus (I normally blog every 2-3 days so with a week I feel guilty :x) but I'm in the midst of exams! Just had my first paper on Friday, & at the end of next Friday I'll be done! So anyhow, a really long time ago I first started wearing this watch below & many people asked where to buy it, so I went back to the shop (heartlands one in Bukit Merah) & bought the remaining pieces! And today I'll be doing a GIVEAWAY of those 3! Uhh... kind of a bribe because I have no time to update this space right now! All you have to do is "like" this photo below on my Facebook page! I'll end the giveaway next Friday 10 May 2013, in conjunction with the end of my exams! Can I ask what software/app you used for these cute graphics? "P.S. Doodles credit to #brenoverlays, Google for more info"! Hi Sophie, I am currently struggling with Soci theories - they are pretty quite confusing! How would you define realist? What makes them? Would you categorize Durkheim as Realist or Idealist? Never studied that & you're not giving me much to go on. Try Googling the theorists that talk about it? I've liked both your Facebook page and the picture itself. 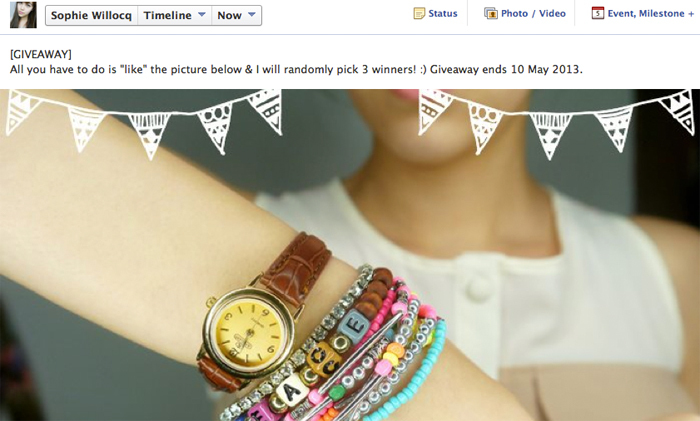 There were seriously so many entries, just hope that I could win one set of the watch and the Hello Kitty clip. Thanks for the giveaway, those watches are to die for omg <3 ANd all the best in your exams, I'm sitting tests as well :( 3 papers more! :O You read my blog :O I follow you on Instagram! I got some curves through the links you provided as well, first time using curves! But only the presets by Julia Trotti because I can't be bothered to try on my own & I don't even use (or know how to use) a DSLR yet hahaha. OMG Sophie, I LOVE your hair!